The Ruler Company is dedicated and passionate about rulers. We know just how important these pieces of stationary are in the day to day lives of many people. Everyone from school children right through to employed professionals and all in-between will need to use a ruler at one point in their life. Many people use them more regularly - like young children who are just starting school. Therefore, if you have a child just going into school or are looking to equip him or her with some handy knowledge beforehand, you should consider investing in this great 12"/30cm Flat Times Table Ruler. 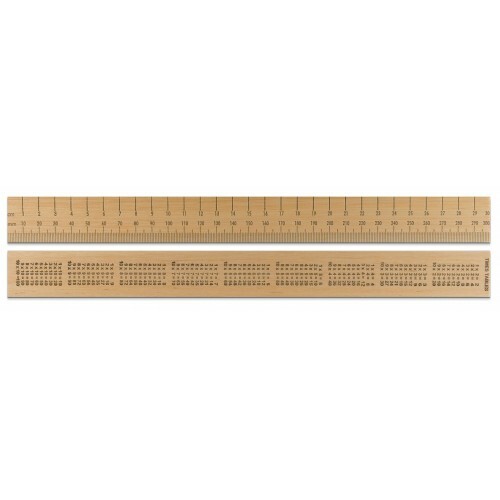 Made from very high-quality and durable hardwood, this ruler features 0 to 30 in cm and mm on the front and on the back includes each of the times tables from 0 to 10. So, not only is this a good first ruler for your child when he or she attends school, it can be used to help them learn their time's tables too. All our rulers, unless otherwise stated, are made from high-quality and extremely durable hardwood. We chose hardwood for most of our products because of its more tactile and weighted feel; along with the fact that it is less likely to break or snap easily compared to the many cheap and inferior plastic alternatives available nowadays. We take stationary and rulers seriously and are committed to only providing the best quality products, like this 12”/30cm Flat Times Table Ruler.